"Jeder sollte diese Software benutzen"
Ich mag es, dass wir mit Scrive alle unsere Dokumente in kurzer Zeit signieren können. Das ist wirklich wichtig hier, weil wir wirklich Zeit sparen wollen, um andere Sachen zu machen. Ich benutze diese Software auch in meinem Android-Handy und es hat jede Funktion, die ich brauche, damit ich es nicht in meinem Computer verwenden muss. Sie können die Sprache der Software ändern (Es hat 10+ Sprachen, was ich sehr schätze). Ich wünschte, es gäbe mehr Organisation in dieser Software. Ich meine, die Kategorisierung von Dokumenten ist wirklich wichtig, und das Fehlen dieser Software ist etwas, das ich hervorheben sollte. Ich empfehle diese Software jedem uneingeschränkt. Ich liebe absolut, wie viele hilfreiche Funktionen diese Software hat und denke, jeder muss wissen, wie toll diese Software ist. Wir verwenden es, um Dokumente zu speichern und sie an einem sicheren Ort aufzubewahren, wo wir sie lange aufbewahren können. Es ist so einfach zu bedienen und unser Workflow hat sich sehr verbessert. "It has made managing documents so easy!" It's a very simplistic software which has enabled e-signing and validating documents and contracts very easy. It saves a lot of time, and so far it has worked perfectly on all the platforms I have used it on. The customer service is very prompt and helpful, as they walk you through any queries that you may have. Nothing that I dislike at the moment. I am still testing it out and it has been nothing but extremely helpful so far. I absolutely recommend corporations to incorporate Scrive. I have used it to manage a lot of contracts, reaching out to a large number of people at once, and make the access to documents very easy. Since the majority of our clients are in apparels, this has also made us to improvise the ways in which we can communicate. "Scrive made everything a lot easier"
Scrive is super user friendly, great for a company with many account managers. Ive gotten all the support I need, sometimes far after office hours. Would recommend everyone who sign agreements on paper to try this, its a no-brainer for me to take Scrive with me to my new workplace. It saves a lot of time, for both us and our costumers. The biggest benefit for us is that our (young) costumers have easy access to the documents and can sign it when ever they feel ready to. We feel that costumers born later than 1997 rather sign agreements online than on paper. Its not that important now days to meet in person! "Very happy with the service, and the simplicity of it." It is simple to use. Self-explainging for non frequent users. Nothing to dislike. If I have to admit something it is the lack of a function for a part in the flow to get a notification of a finished document without getting the document attached to the email. Sending out employee agreements for new and existing employees. We use Scrive for other agreements as well, it saves us a lot of time. "Life saver! Make us much more time efficient!" Scrive minimize the time that go to waste. It's a click away and you have signed all your documents. Instead of printing and scanning and the time wasted is more than my coffee break. My work efficiency has gone up. It just make my work no my life easier. It is easy to use on your phone, computer and tablet. Love it! Even if there is something I need to sign on my spare time it take to seconds not half an hour. LIFE SAVER! It is quick and save time!!! So far nothing. It's just work smooth everything from support to how easy it is to use. Change to it! Life saver! It save so much time! It is ridculous! Why don't everyone use it! I have used Scrive on my android phone and I love that their app provides you with all the important features and I don't have to keep on opening my laptop again and again. I usually add my assistant or peers to collaborate with me on certain less sensitive documents. It's really easy to use and the customer service has been very supportive. My documents appear as a series of pdfs merged together. I wish I could see them categorized and divide them into directories. Scrive saves me a lot of time when I either need anyone's signature or collaboration on a report. I don't have to make any copies of the report and it helps reduce the paper usage in our department. "Invaluable tool to make our sales and employment process smooth"
It´s an easy to use tool that requires no training. It is also integrated into our CRM Upsales, making it easy for sales people to close contracts in a modern and efficient way. There is still a lot of questions regarding the validity of the contracts due to low to medium market maturity. We typically encounter this with older, not so tech-savvy customers. However, it is something that is diminishing. We close more sales, faster. We sign candidates in a more modern, transparent and smooth way. 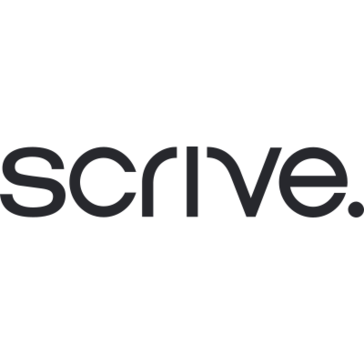 "Tool to increase effiency and close more deals"
With Scrive we save time because obtaining a digital signature is much more convenient. We do all of our agreements and business proposals with Scrive. It is user friendly, conveniet and secure! We could benefit from more flexible licensing models and address books in the tool. We have made our sales process much shorter. Scrive löser de utmaningar vi haft med att digitalisera och effektivisera vårt flöde. Det underlättar för våra kunder OCH för oss internt. Lösningarna kan även användas för ett ”gammalt” system och där förändringen skulle ta lång tid eller vara omöjlig att implementera. "A great service for ourselves and our customers"
The integration possibilities and the fact that the support multiple electronic IDs in several markets. We use Scrive for internal use but also as a joint services offerings to clients. I Also appreciate their partner team doing a great job for us. Not much to dislike. Could have been integrated with our AD. Scrive is a perfect partner, both professional in handling clients and communication but also providing a reliable service. Easy to use interface, for our users as well as the end-users. High level of integrity, providing a trustworthy service for e-signature. Nothing in particular. Even though our volumes are pushing the need to make the leap to the API-solution triggering a lot of development on our side. Great service, good performance, reliable and excellent support. Less time spent on administration, increased control. "Easy to use, many possibilities"
The ease of use with Scrive go bundled with the many possibilities of the integration. Sending contracts to customers without identifying them first, with BankID/NemID identification we can send them out without worrying about leaking personal data to the wrong person. "A must have for growth companies"
Hard to fork out a single feature. Its the complete experience of digitalising the creation, signing process and storage of agreements. "The most user-friendly e-signing solution in the market! " I really like the interface and also the flexibility in the system. That you aren't able to use Scrive when you need to scan a document. I save time and money. I also have all my agreements in order and at same place. It has revolutionized the way we manage our documents and the signing process. Instead of waiting days for a mutual sign it is now just few clicks away. I haven´t seen anything that doesn´t work the way I like. Support is good and product is solid both on the user and administrator side. It helps us get signatures on agremeents extremely quick, which saves time and get us more business. Also the management of the agreements is way better than before. "Scrive saves a lot of time, money and stress"
Closing, follow up on sales, coordinating with a big sales team etc. "Great service! I use Scrive at least every week and it eases my work as a lawyer"
The simplicity of the service for my costumers. That everything is digitally saved and simplifies my daily work. "Great service to create a great product"
* We monitor all Scrive reviews to prevent fraudulent reviews and keep review quality high. We do not post reviews by company employees or direct competitors. Validated reviews require the user to submit a screenshot of the product containing their user ID, in order to verify a user is an actual user of the product. Hi there! Are you looking to implement a solution like Scrive?